On Sunday, Oct. 7 at 7:21 p.m., people through much of California — at least those who happened to look up at the right time — were startled to find a strange light streaking across the night sky. What some believed to be aliens or a rogue, unidentified, flying something, was actually a SpaceX Falcon 9 rocket delivering a SAOCOM 1A satellite into orbit. The spectacle was captured by a host of folks throughout the state, from Northern to Southern California. Posts on social media showed images ranging from ghostly halos ringed with rainbow-ed smoke, to sharp arcs of almost blinding light. The above photographs illustrate what's known as the Twilight Phenomenon, caused by unspent fuel freezing at high altitude. The frozen particles reflect sunlight below the horizon and display different colors against a dark background. The rocket was launched from Vandenberg Air Force Base, located on the coast about 130 miles northwest of Los Angeles. The satellite, which is operated by Argentina’s Space Agency, the National Commission on Space Activities (CONAE), was deployed 12 minutes after liftoff. Following stage separation, Falcon 9’s first stage returned to land at SpaceX’s Landing Zone 4 at Vandenberg, marking SpaceX's first landing on the West Coast. The Air Force had warned Central California residents that they may experience a sonic boom. But the curious display sent many Californians scurrying to Google to see if they were under attack — searches for "UFO" peaked right after the 7:21 p.m. launch. SpaceX says that Falcon 9 is the first orbital class rocket capable of reflight, designed for the reliable and safe transport of satellites and other spacecraft into orbit. 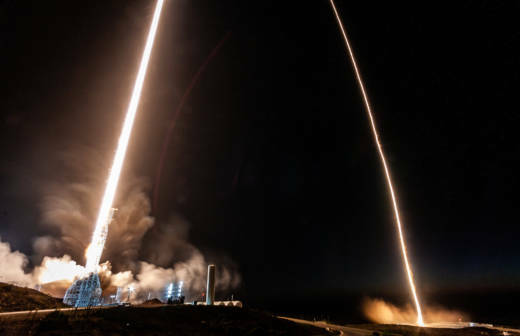 Whereas previous rockets burned up upon reentry into Earth's atmosphere, the reusability of SpaceX's rockets is the "fundamental breakthrough needed to revolutionize access to space," according to SpaceX founder Elon Musk. The SAOCOM 1A satellite launched this week is the first of two for Argentina’s space agency; they will work in conjunction with a constellation of Italian space agency satellites already in orbit. SAOCOM 1A carries a high-resolution instrument called a "synthetic aperture radar" that will be used to gather soil moisture information for help in land monitoring and emergency management during disasters.